The distributor with the vacuum advance is correct. The distributor can clearly be seen in the photo in the Ti/SA owners supplement. BMW used this dist and left the advance unit unplug as there is no port in the Ti/SA intake manifold. does anyone have the black lower dash pad for a car without a radio, and the trim above it? Not trying to start any bar fights here, but I'll provide info I have from 1800 Ti manual and TiSA supplement. As I recall the one on #133 ended in 048. I'll admit to ignorance here. Never heard of vacuum advance until yesterday. Brain surgery is easier than some of this stuff, but learning all about the car is great fun. On the subject of bucket seats, I got another email from Bryan Purves. He tells me he has photos of the TiSA seats from all directions. He thinks that if he had patterns for the surrounds he could make the seats. I'm hoping Peter can assist with the patterns. Bryan also told me he'll be out of action for a couple months due to an upcoming surgery, but might be able to do some preliminary work during his convalescence. If a few others are interested in this seat quest, a group buy might encourage him further. wow, that's interesting, the IFUR 4 is the stock 02 distributor (with vacuum), and obviously different to the Ti distributor that Peter and I are talking about. 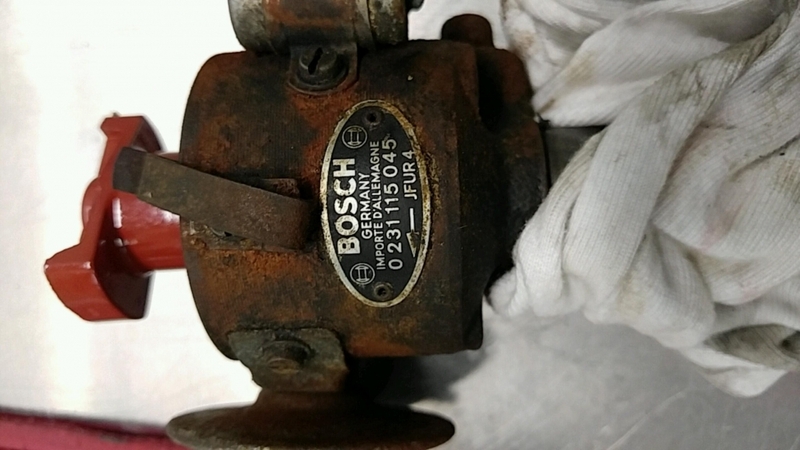 Didn't even know Bosch made a non-black cast distributor back then. What does yours have Peter? awesome documentation, thanks for sharing. Guess they might be talking-up the drilled inner panels of the boot and bonnet (trunk/hood), but I thought that was generally done by the racing teams and not the factory? At least that's what I recall reading somewhere? I will go up to the barn this week, where the Tisa is in winter slumber, and take pictures of the distributor. It may be that BMW had old distributors to use up and left the vacuum mechanism on the outside. To set the timing on the mechanical non vacuum advance distributor in a Tisa you could just put it at top dead center with a static timing light, and it would generally be Pretty darn close. I do not remember ever seeing a Tisa with the vacuum advance on it, of the approximately 10 I have seen. I think Nick has the right idea, if the distributor in the car can be dated later than 1965 then it may represent a subsequent change. I am still open minded that it may be the original yet anomalous distributor. There are some small differences seen in the owners manual supplement, that I have not seen in/ on the road cars, such as the Posteriorly angulated gear shift selector mechanism bringing it closer to you, more like a 356 Porsche. This was a factory homologated car for racing, so I would not be surprised by some variance in the bell curve of Tisa build characteristics. I do not believe that they used thinner gauge sheet-metal, like the Porsche RS ', for the bodywork. Many people ended up drilling the doors, hood and trunk support structures to reduce weight. This was in fact why the 1800 TISA was not more successful with competition because the Lotus Cortinas, and Alfa GTA s etc were significantly lighter than a four-door BMW. I think the Lotus Cortinas even had some aluminum body parts on them. I will make templates /quasi blueprints, and take additional photographs of the correct Tisa seat Bolsters with measurements and send them to Terry and Bill this week, who can then forward them to Bryan. I will also start digging around for any extra under dash panels, Correct wheels and other things for this beautiful time capsule. Again, congratulations Bill I think you've chosen very well. It is rare for an old sports racing car to have survived and be so intact. With the exception of the seats every precious bit, such as the TISA cylinder head, and matching webers, intake manifolds, and five-speed gear box are present. The original close ratio five speed is a bit anemic/weak, many of us have replaced them with later model units, and put the originals on the shelf. It may be that yours is in better shape than most. This is the dizzy on #133. Comments? It's great to see another one get resurrected! Making me want to get workin' with my Dad on his! My distributor ends with a 26. Was that 026 in a TiSA or what other NK? Was that 026 in an 1800Ti/SA or what other NK? I have another question regarding TISA parts. In what way do the front calipers differ from the default 1800? Do they use the same brake pads? Reason I ask is because I replaced the calipers on my 1800 TI with a set that I had found among my spares and noticed that they appear alike but there are some changes (cooling vents) on the outside of the calipers, they still use the same brake pads though. I wonder where the different brake calipers came from. Callipers are single line and like 2000cs. I'll ask in advance for your collective patience as I work through some parts needed for the car. It seems that the radiator is the same as for an 1800 Ti. Agree? Anyone have a fantastic one available?